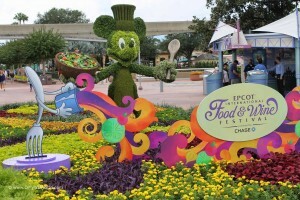 Epcot International Food & Wine Festival Has New Offerings! The Epcot International Food & Wine Festival, celebrating it’s 20th year, returns to the Walt Disney World Resort Sept. 25-Nov. 16, 2015 with more than 30 global marketplaces to explore. For the first time ever, the festival is stretching into the park’s Future World with four new food and beverage marketplaces. 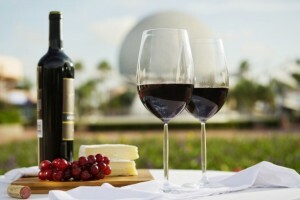 Along the walkway toward Future World West, you can enjoy the new Artistry of Wine & Cheese festival area, which will feature the Cheese Studio (offering a cheese sampler served on an artist’s palette to pair with wines) and the Wine Studio with premium wines on tap. Near the Epcot Character Spot, you can discover the new Next Eats area, featuring the Sustainable Chew and Chew Lab marketplaces inspired by ABC’s Emmy-Award winning lifestyle series “The Chew,” starring co-hosts Mario Batali, Michael Symon, Carla Hall, Clinton Kelly and Daphne Oz. Sustainable Chew will offer three dishes, and Chew Lab will show off hot culinary tech trends like a Liquid Nitro Chocolate Almond Truffle with Warm Whiskey Caramel. Rockin’ Burger Block Party – You can get a glimpse of the cast of ABC TV’s “The Chew” at this new premium event on Oct. 8 in World ShowPlace. They’ll enjoy specialty burgers and sliders inspired by top names in the music industry such as Dave Matthews and his Dreaming Tree Wines and Carlos Santana’s Casa Noble Tequila. (Two additional Burger Block Parties are set for Sept. 25 and Nov. 6.) This event includes VIP seating with a specialty cocktail toast, premium bar and more. Yelloween Masquerade Party for the Senses – This first-time event on Oct. 31 will be one in a series of popular Party for the Senses premium events. You can experience an elegant, dance-the-night-away, gourmet tasting party with Champagne, wine, craft beers and specialty cocktails paired with food. Another Party for the Senses you won’t want to miss takes place Oct. 24, and features Disney chefs from the United States, Europe and Asia cooking their favorite cuisine that represents their cultures as well as the Disney Parks and Resorts they call home. What’s Cookin’ With …You can begin the morning with a delightful plated brunch and sparkling wine toast. Culinary celebs will demo a favorite dish and then sit down with the emcee to answer questions from the audience and share secrets of their successes. The brunch happens every Friday and Saturday at 10 a.m. during the festival. Others premium events include the Mexican Tequila Lunch, Japanese Craft Beer Tasting and the new French Family Meal Traditions. Reservations for these premium events open at 7 a.m. on Thursday, July 30. And, while some favorites fill up fast, there are lots of new events to celebrate the festival’s 20 years at Walt Disney World Resort. 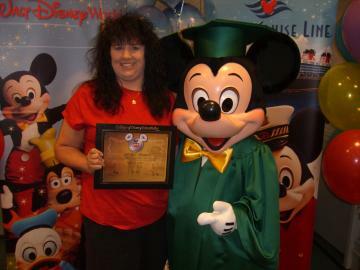 Let Our Laughing Place Travel take care of all your reservations for you when you book your Walt Disney Resort reservation with us. Previous PostDisney’s Candlelight Processional 2015 at EpcotNext PostDisney’s Polynesian Village Resort – A Whole New Experience!